Why Should I Install an Aluminum Awning this Summer? Are you looking for a way to keep your home cool this summer without having to blast the air conditioning? Air conditioning systems can be expensive to run, and on some days, it’s not quite hot enough to justify running them, but nor is it cool enough to go without anything. That’s where Carroll Awning steps in. If you want to save on energy and expenses this summer while still keeping comfortable, then an aluminum awning is for you. Most people think of a traditional canvas awning when they think of awnings. Canvas awnings are, of course, a wonderful investment for your home and they too can contribute to lower energy expenditures. 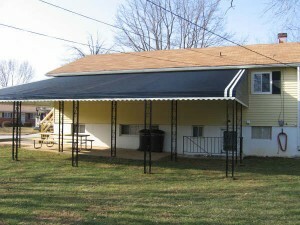 However, an aluminum awning is an option that homeowners should not overlook. Aluminum awnings have many benefits to them. For one thing, they can be custom designed by Carroll Awning Company to serve as a patio cover, a carport cover, or a porch cover depending on which area you select. Unlike canvas awnings, which are typically taken down and stored during the winter months, an aluminum awning is a permanent installation for your home. This means that it can add value to your property in the event you decide to sell. Aluminum awnings reflect light away from your windows and home, which in turn prevents the sun’s rays from heating up your home and making it uncomfortable. An aluminum awning, as an investment piece, returns more than its fair share in cooling comfort, curb appeal, and home value. Do you have questions about designing and installing an aluminum awning? Call on the experts at Carroll Awning Company today for more information!